I will conclude this Niagara peninsula excursion with the wine and the domain which attracted me the most. This meeting with Jens Gemmrich on this sunny afternoon, in a place very close to Niagara falls, certainly worthed the visit. It is the first time I can meet up with the owner of the farm who is also the winemaker and the vinegrower. 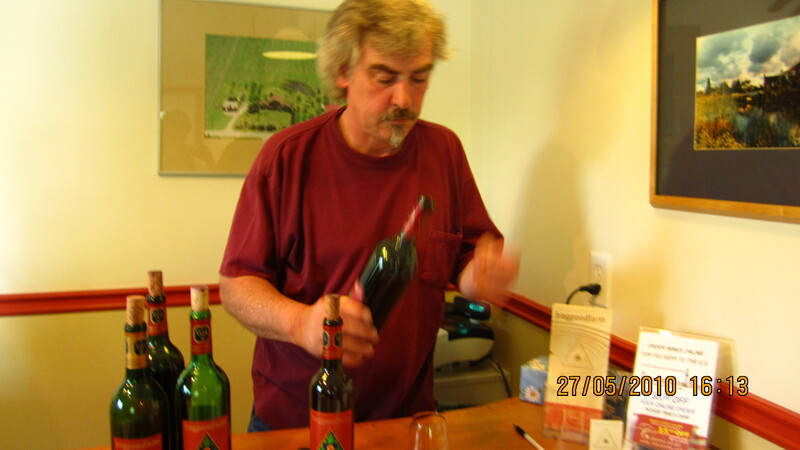 It is not so common, as usually here in Canada from what I could see so far, winemaking is more of a hobby so to say, for rich bankers from Toronto, investors from abroad or businessmen wanting to make wine. Never I’ve been received by the owner except here at frogpondfarm. I had to call up several times ahead before setting up an appointment with Jens. The email address seems not to work properly and I couldn’t get trough when I wrote them at the first time. Once again , thanks to the Biovino wine tasting at my arrival in Canada more than a month ago, I could find this farm producing the best value wine among all of what I’ve visited. It is a small wine shop in which we enter at first, where relaxing music is played and friendly atmosphere is perceptible. 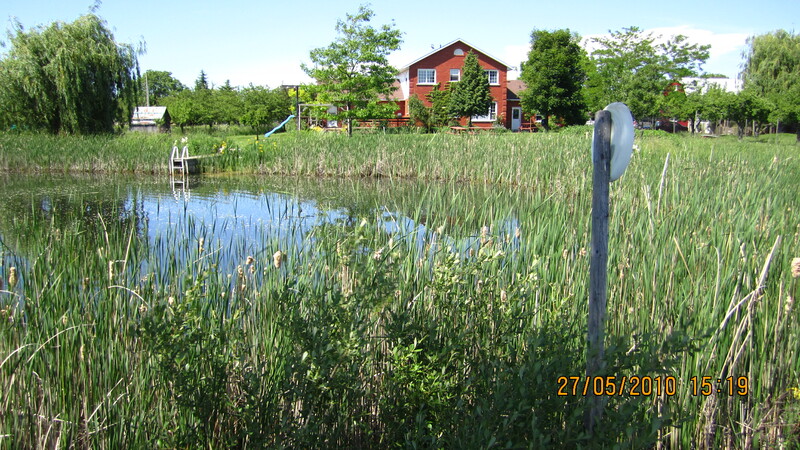 The farm is only 10 acres and in the middle of it we can see the pond where the name of the farm is coming from. frogpond farm without a pond and frogs would have been out of place, isn't it ? 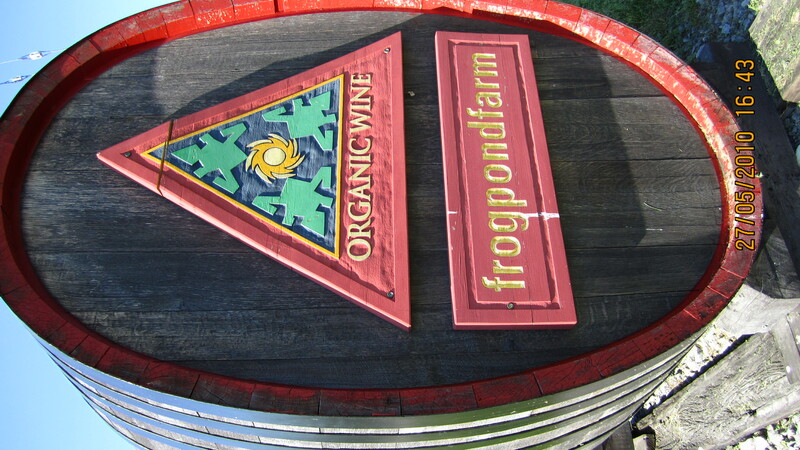 At frogpondfarm they farm organically since 1996 and started to make wine in 2001. We can find here also some fruit trees, sheep, guinea fowls, and chickens . This diversity on such a little piece of land brings a lovely atmosphere of cosiness and liveliness. In 2004, they then bought 20 acres of land on an other farm to produce more grapes. 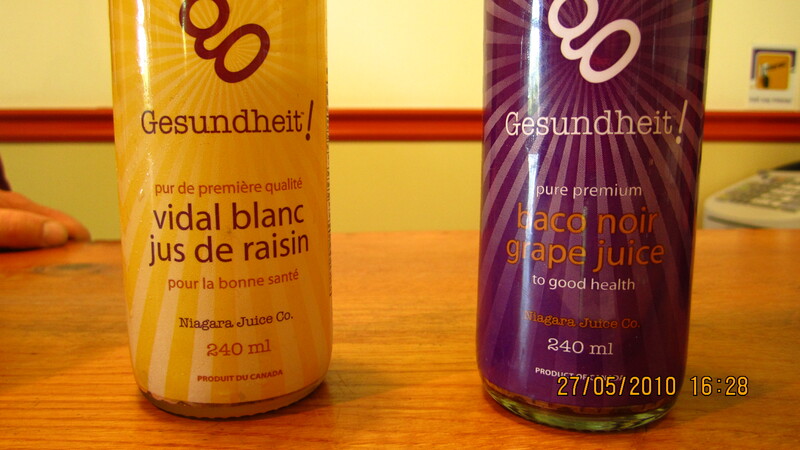 It is only in 2007 that they got the organic certification Pro-cert Canada. 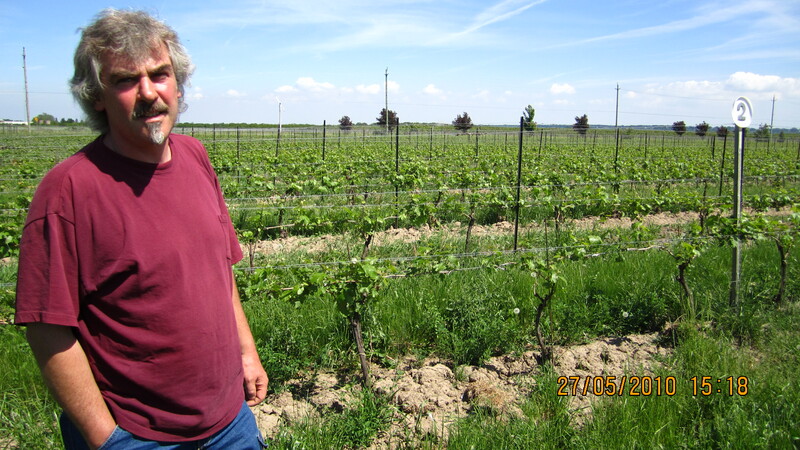 Since the beginning of the visit, I’ve been touched by the authenticity of the farm, by Jens the owner, and by the wines. All of them express great character, depth and beauty. 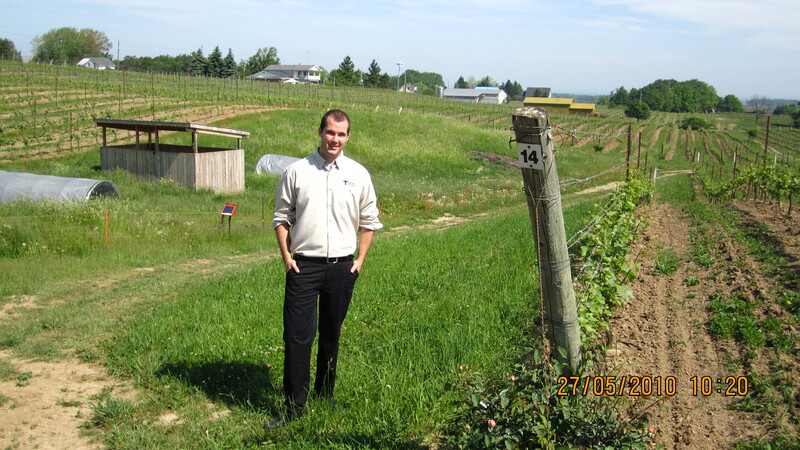 Not having a lot of time for our meeting, being at the pick of the growing season, Jens will show me around and we’ll have a quick walk around the pond, in the winery, and in the tasting room where they receive their customers. At frogpond farm, they are not using oak barrels at all, and this is the first time I have the privilege to taste some wines without any oak barrel ageing at all. For Jens, there is no coherence when using oak barrels only for 5 years, where it took a single oak tree more than a hundred years to grow and to reach adulthood. This is not a sustainable process for him . « At this pace we’ll soon no longer have oak forest anymore ». 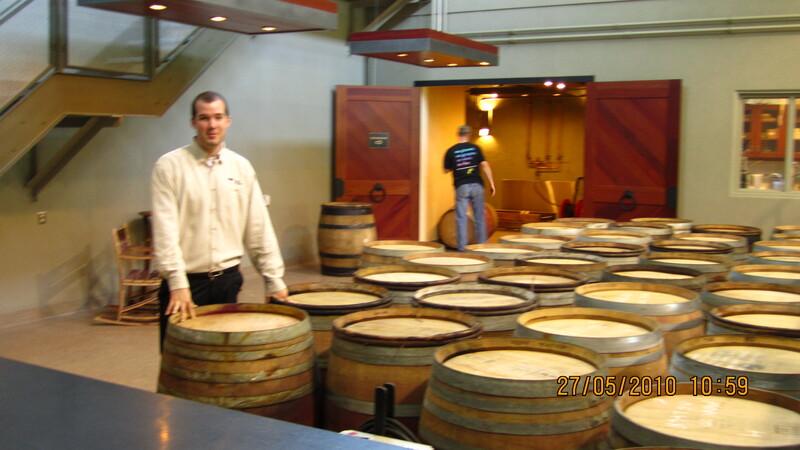 The only oak he uses is vat oaks – much bigger barrel of 2500 liters each – from Germany. 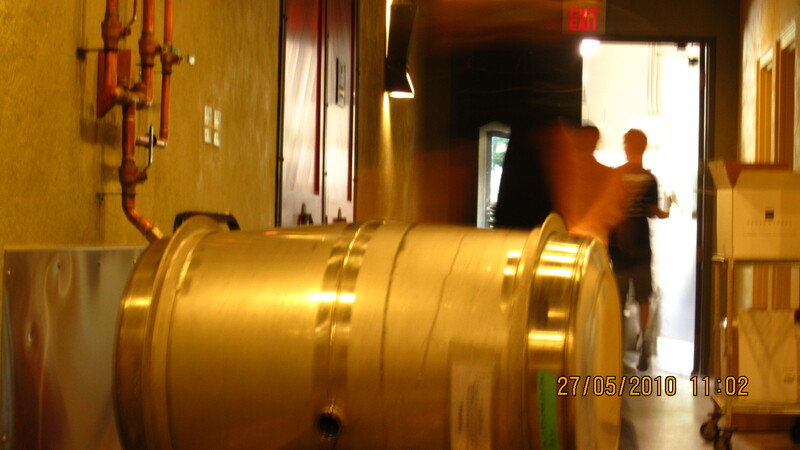 If handled properly, they will last more than a hundred years old each. Year after year he uses them and has very good result with them. 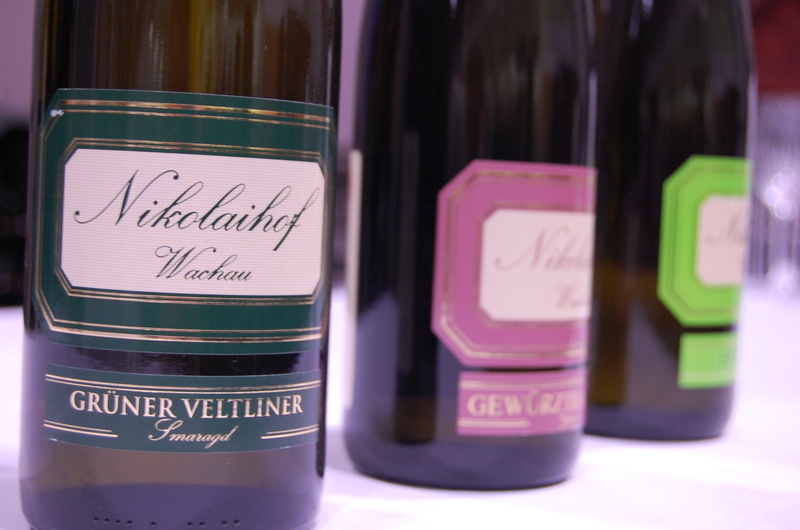 With the tasting, we find an homogeneity from the beginning to the end. 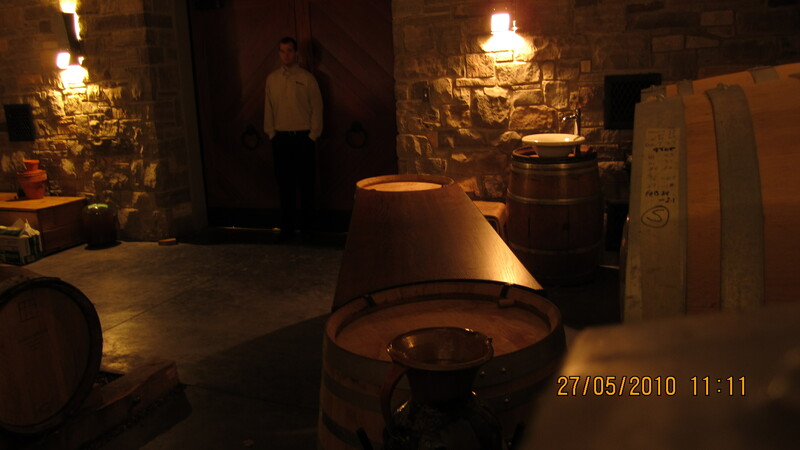 The same rigorousness is done in the winemaking. 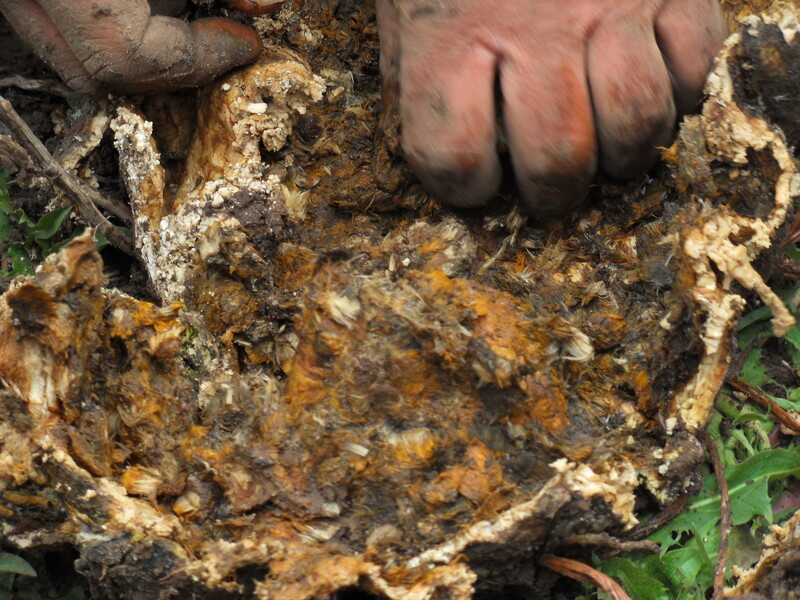 No fining, indigenous yeast most of the years, respect of the fruit and of the terroir. I find great depth and originality in these wines and it is a real pleasure to see them sold between 12 to 15 $ (9 to 11€) out of the farm. When tasting these wines we find sapidity, minerality, complexity and character. 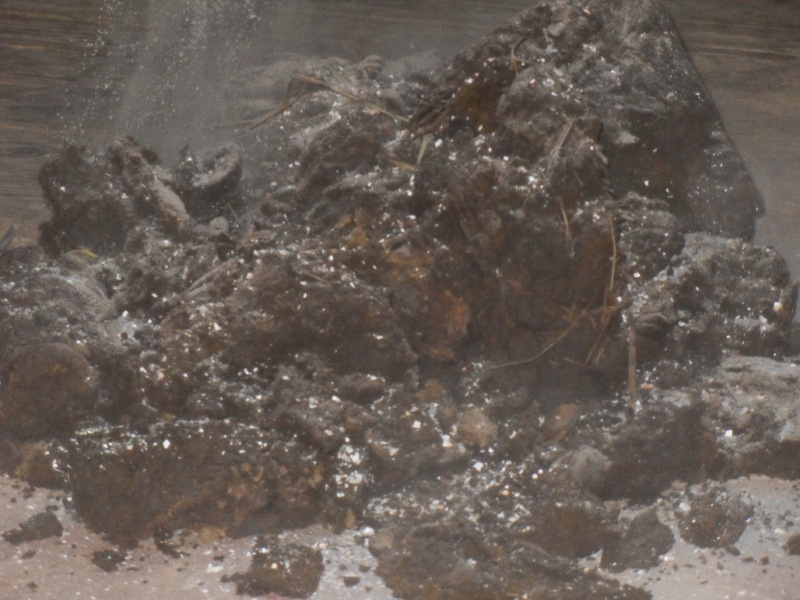 A very small quantity of sulfur is added to the wine, only between 5 to 20g per liter. 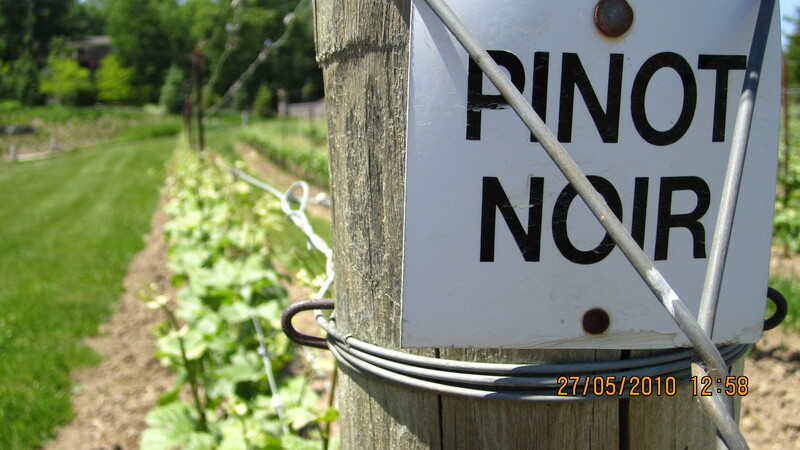 For the little story, one the wine (Chardonnay 2007) has been refused for the agreement by the VQA (Vintner Quality Alliance), the body which gives the appellation to the wines in Canada. It is a body of so called expert who are used to taste all the time the same wines. When one wine is a bit different, they will refuse the agreement. It makes me thinks of the huge fight nowdays in France regarding these winemakers who don’t look anymore at the appellation system and sell their wine under the generic name Vin De Table (Table Wine). Nevertheless, they can manage to sell their wine to top restaurants in the world wherever it is in New-York, Tokyo, Paris or London. These wines are often the perfect wines for food pairing and sommeliers in restaurants will serve them as a discovery for the customer under blindtasting conditions most of the times. There is some freshness to be brought to the french appellation system and the late René Renou, the ex-président of INAO (Institut National des Appellations d’Origines) was one of the few in the heavy french bureaucracy to lead this movement for a more meaningful appellation system. telling me anything about it and its refusal before the VQA agreement, I simply answered that this was the wine I’ve had most enjoyed so far. Strange enough, it has been tasted as oxydised by the agreement. In fact, from my pointof view, I don’t even taste the slightest oxydisation in the wine. 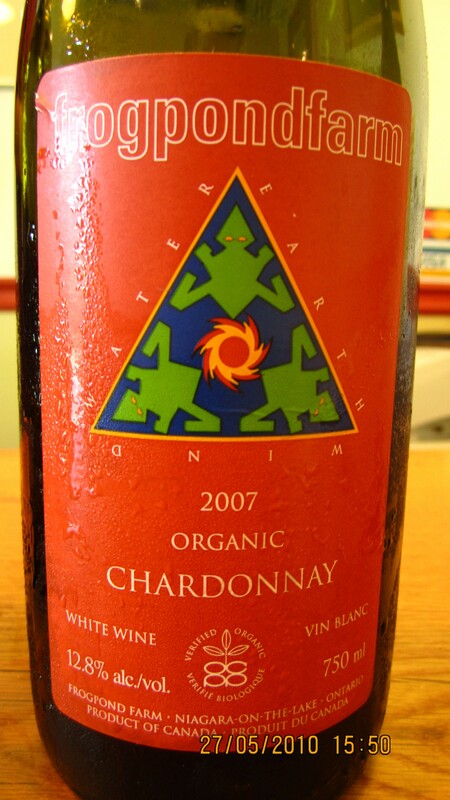 I find delicate acidity, lenght, complexity, pleasant texture, and a bit of CO2 which brings freshness and drinkability. For 13 $ (10€), you end up with a great wine suitable for gastronomy. Let it breathe for 4 hours before enjoying it not too cold. 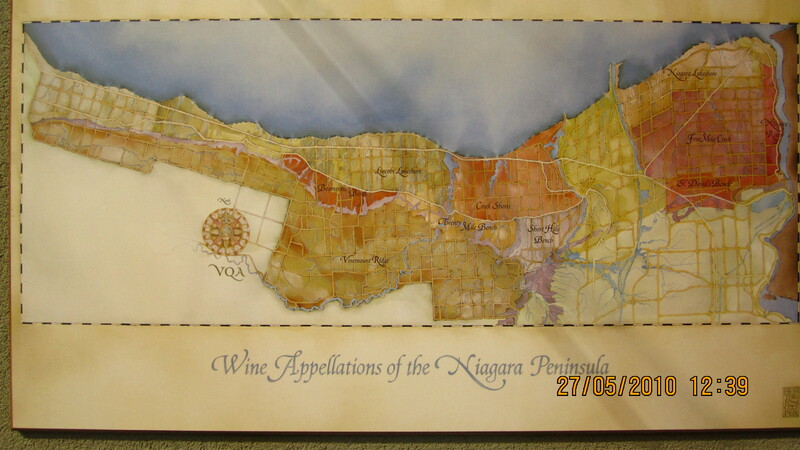 You’ll notice how Niagara peninsula can produce author wines made from real artists. 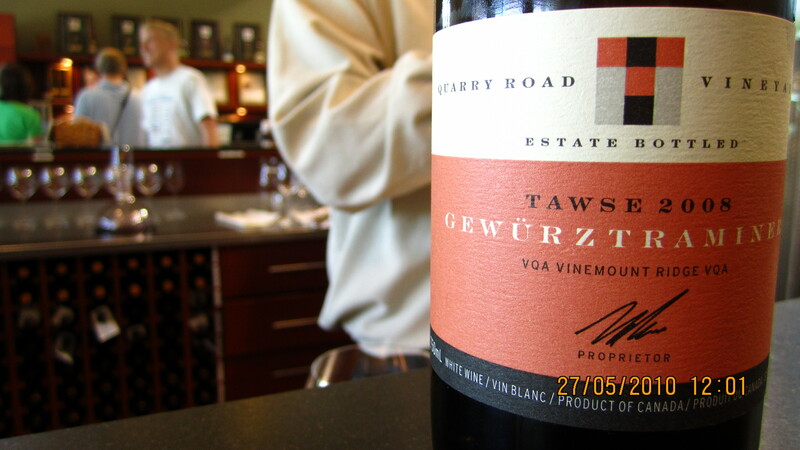 This wine is a proof to show that Canada has done a step further in the terroir expression. 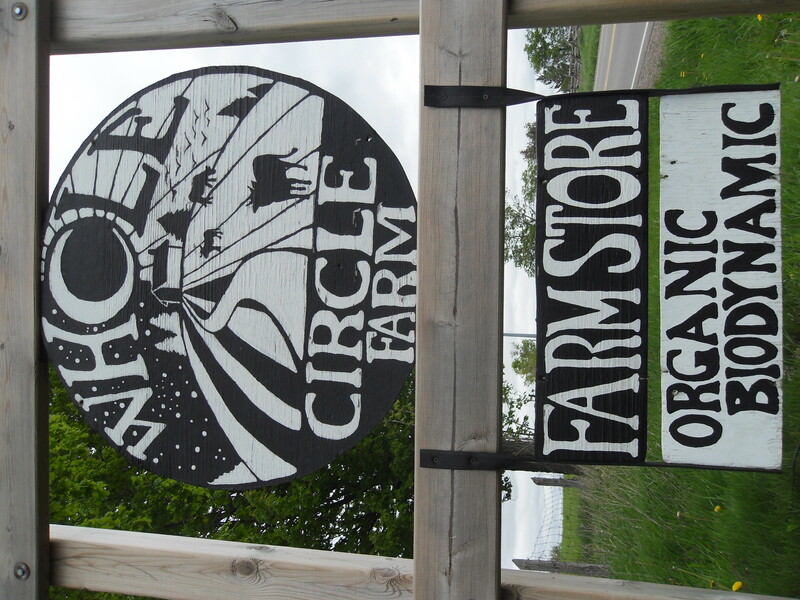 I would recommend to stop by this farm whenever you come to Niagara Peninsula area. Furthermore you’ll discover some grapes such as chambourcin and will be able to taste the purest grape juice I’ve tried made also on the farm. Taste the authenticity, visit frogpondfarm ! All I knew about the Canadian wines before coming to Ontario was the inevitably Ice wine made from this country. Weather conditons with harsh winters are producing all the factors needed in order to produce this kind of wines. You need the grapes to be harvested at night at -8°C . So, no need to say that it is requiring a special logistic before hand to satisfy this niche market . 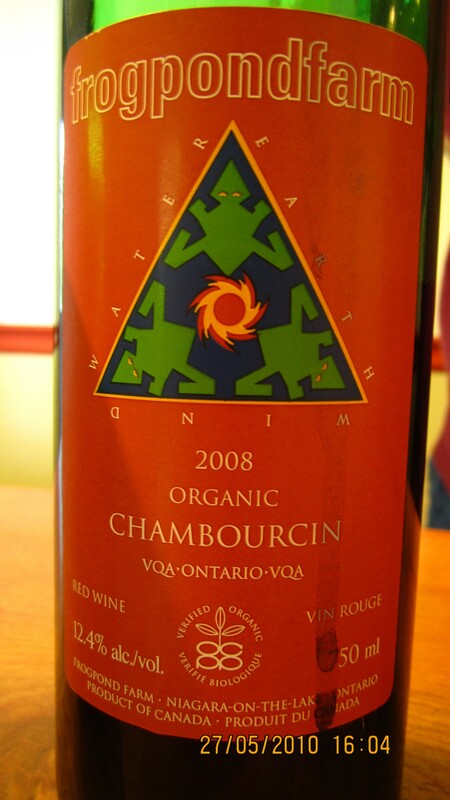 At the London wine fair some years back, I had the chance to discover the wine production from Canada. At that time, I remember, I wasn’t so impressed by the quality I could taste there. Things seemed to have changed since then in a better way. I should have met with Sara Jensen for the visist of the winery, but unfortunately with a cough, she was unable to comment the tour. 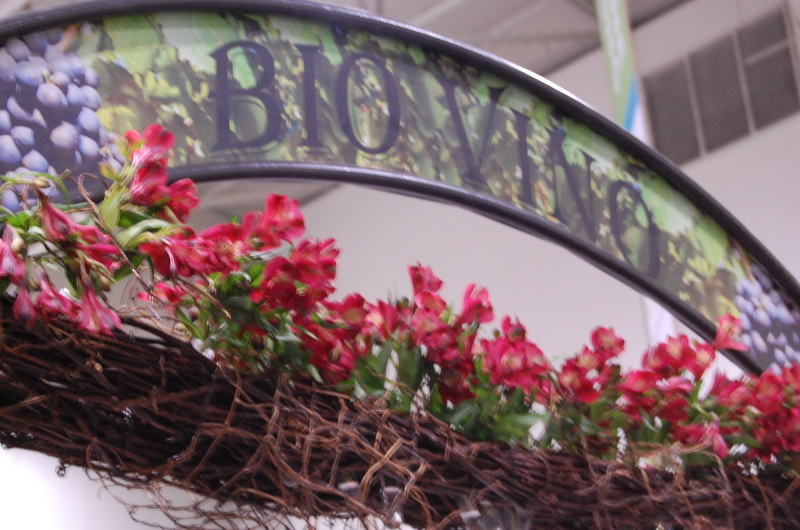 We will nevertheless meet and briefly talk about the Biovino tasting in Toronto where we met for the first time a month and a half ago. Instead, Kevin Knapp, a student from the area, will kindly guide the visit and show me around. 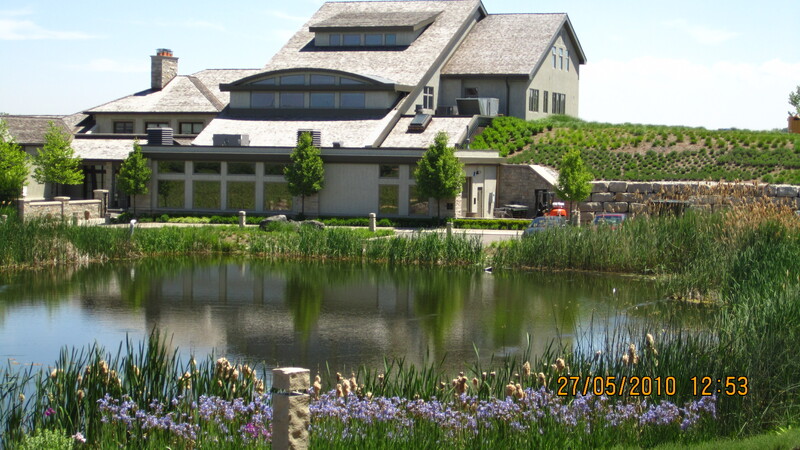 When we pass the gate at the entrance of Tawse Winery, we can’t miss the pond and its bullfrogs singing and hiding amidst the water vegetation . These frogs are now in Europe. In France, I know that they are causing trouble because of their size and their overpopulation. They are originally from the american continent and they came unnaturally in Europe in a new and different ecosystem not so long ago. They are ten times as big as the regular green frogs you find commonly in France, and not having any predators there, they are eating all the food of the smaller frogs living also in such wet areas, when not eating them directly. Kevin took me to the vineyard to start with to avoid the scorching heat of the day. 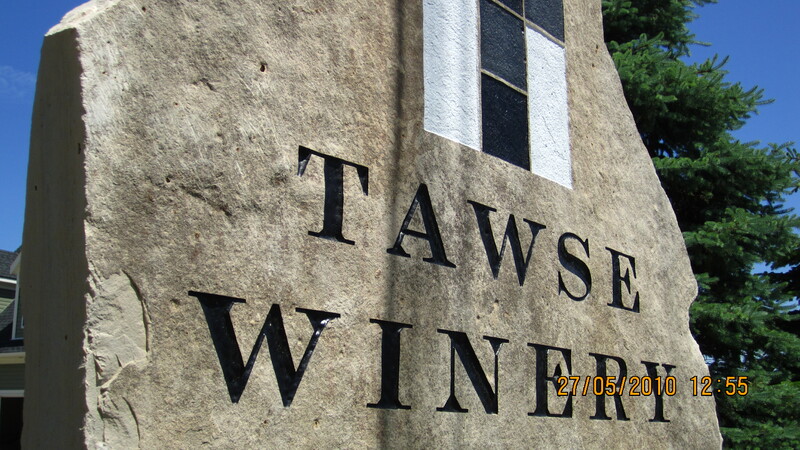 The oldest vines of the estate are 28 years old from the Chardonnay grape variety, but the first vintage underTawse‘s name came in 2001. A swim in the pond to cool down ? In the middle of the vineyard, you can find a chicken coop from where some eggs are sold also from the wine shop. I see it as only a family back yard production and the chickens can’t satisfy the manure production required for the estate. Nevertheless, they bring an another dimension to the vineyards with the animal aspect.Sheep, which we won’t approach today are also to be seen on the vineyard. 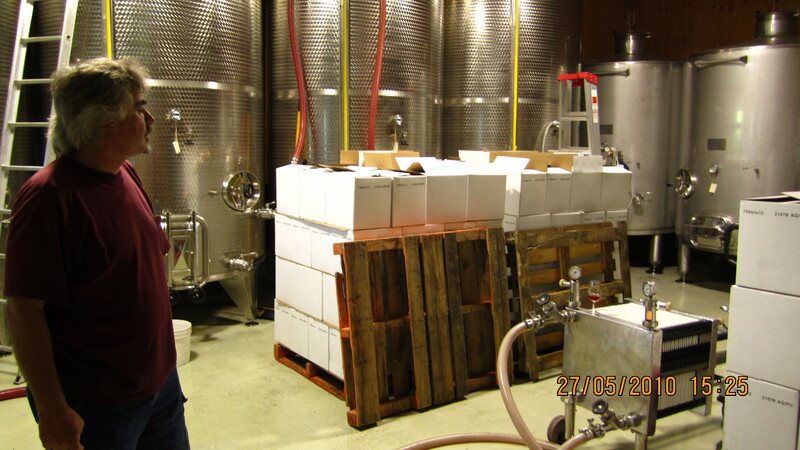 The winery has been designed in a way to avoid pumps from the harvest til the bottling stage. 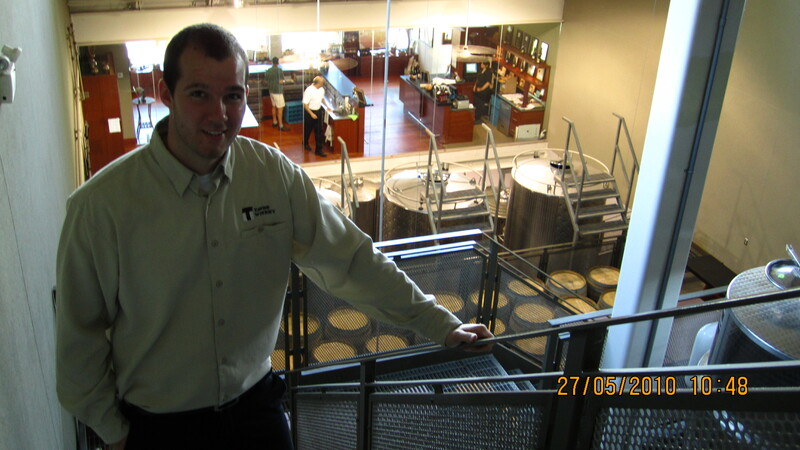 It has 6 floors and uses gravity at every stage of the wine making process. 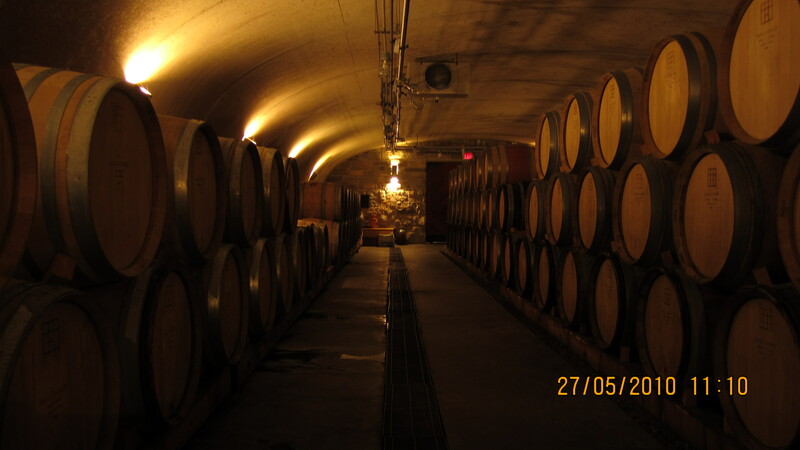 It is cooled down by a water circulation pipe going from the bottom of the 25 feet deep pond – and collecting the freshness from there – to the winery for cooling down the cellar. In this way, they are saving 85% electricity. The grey water from the winery goes to a biofilter where specials reeds are growing and naturally filter the water, which is then released to the pond. Better than the human hand ? When entering the fifth floor from where the grapes are coming from during the harvest, we come face to face with the dynitizer, a copper made mixer made for stirring biodynamic preparations automatically. This is where we find a vertical and a membrane press too. At the top floor, we find the oak vats, then we find the thermoregulated stainless steel tanks, the middle floor is the mezzanine with the barrel cellar, and then the final fermentation stage for the reds and the whites are at the bottom. Among the ten wines we’ll taste, I’ve prefered the reds VQA Lincoln Lakeshore, Cabernet Franc 2007 with a dark red colour, animal, full in the palate, harmonious, with character, for 47,95$ and the VQA Twenty miles bench, Pinot Noir 2007 for its juicy texture, fine acidity, delicate balance and clean expression of the grape variety for 31,95$ CA. 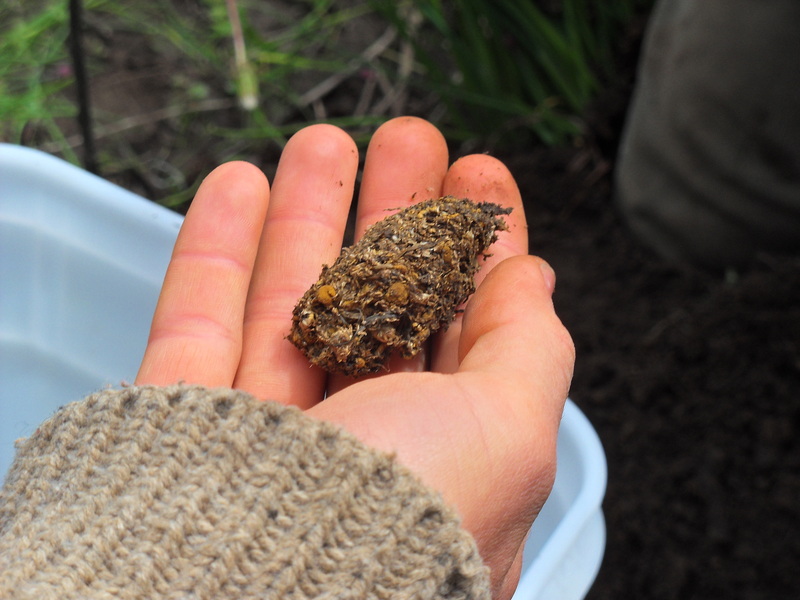 In this post we are going to finish presenting the preparations we are using in biodynamic agriculture, and therefore complete a series of three post about this topic. This day out with Johan, the manager, proved to bring light on the subject. From the preparation 500, we went to the preparation 507. We are now going to deal with the 508 : the horse tail or equisetum. It is the horsetail or equisitum preparation. This preparation is not used inside the compost. It is a tea preparation which serves as a preventive to lessen the effects when conditions conducive to fungus problems exist. Horsetail tea is extracted from the common horsetail, a plant especially rich in silica. When there is a year with a lot of rain use the horsetail tea to damp down the etheric forces into the plant. Use 1,5 ounce for 2 gallons of water per acre, (100g for 20l per hectare) and stir for 20 minutes. 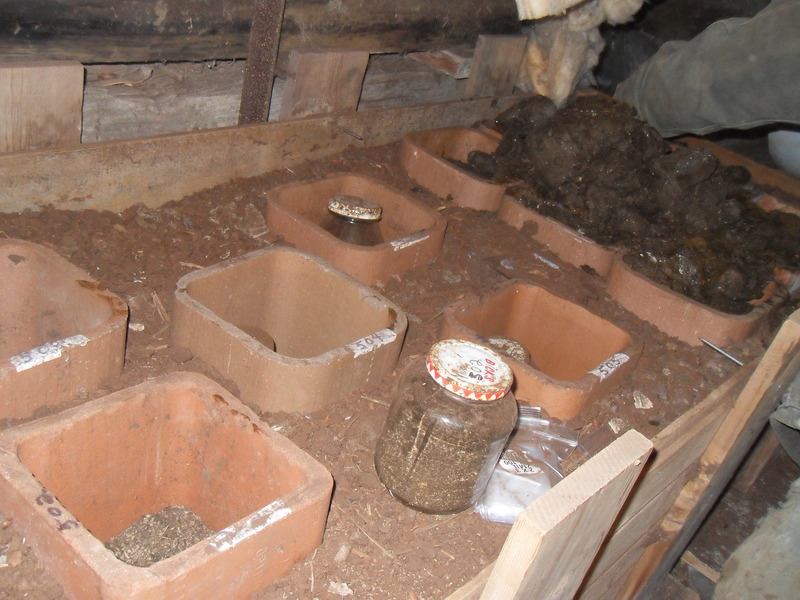 The use of barrel compost compensates to some degree for lack of sufficient compost onto the farm. This preparation has been developped thanks to Maria Thun, a German lady who has been working with biodynamics her whole life. 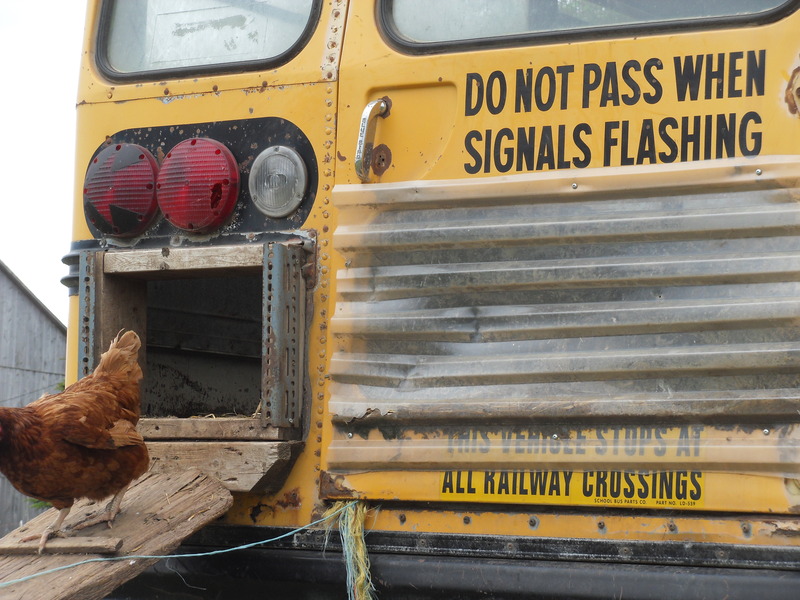 The ideal farm is to have the ideal amount of animals on the farm. Though usually you never have enough compost to put on your land every year, that’s why you put compost on the same field every three years or so. 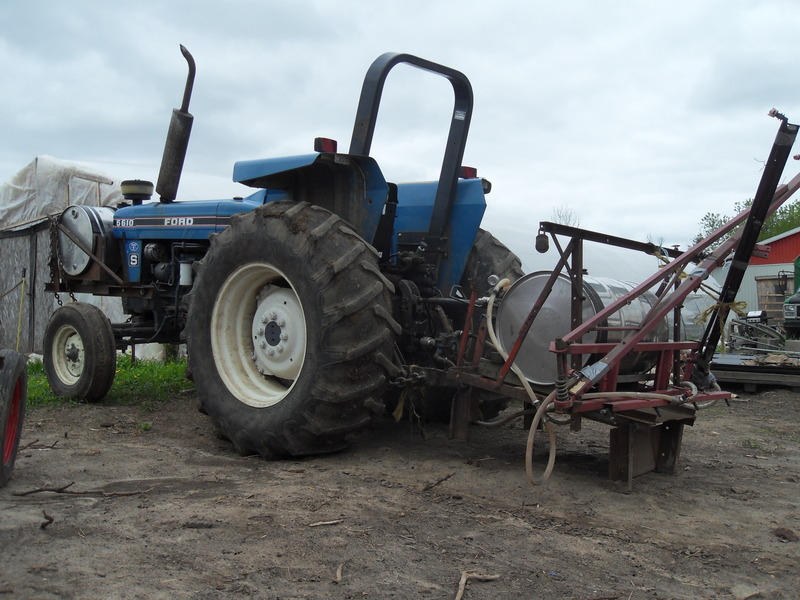 With this preparation, it enables you to spray compost on your field every year. Here the preparations are applied homeopathically. 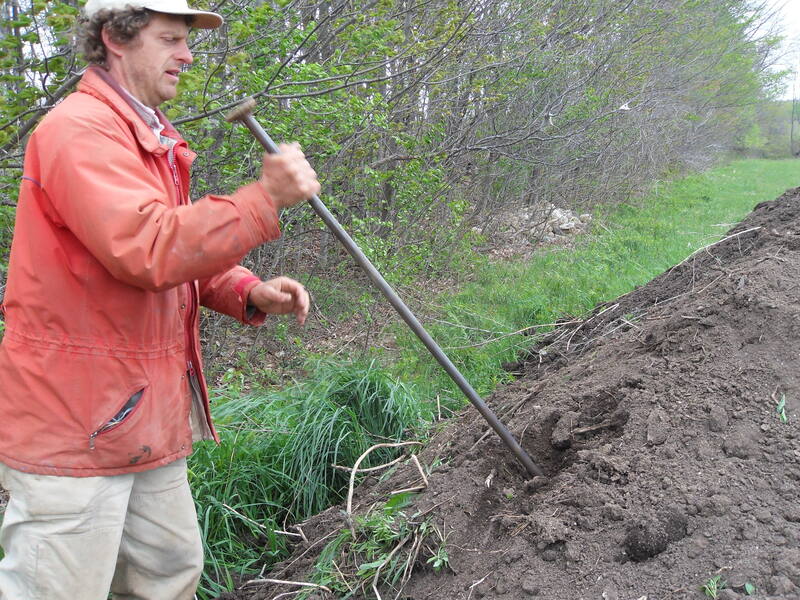 You must use fresh well formed manure from the farm. This is the preparation we made in the afternoon. 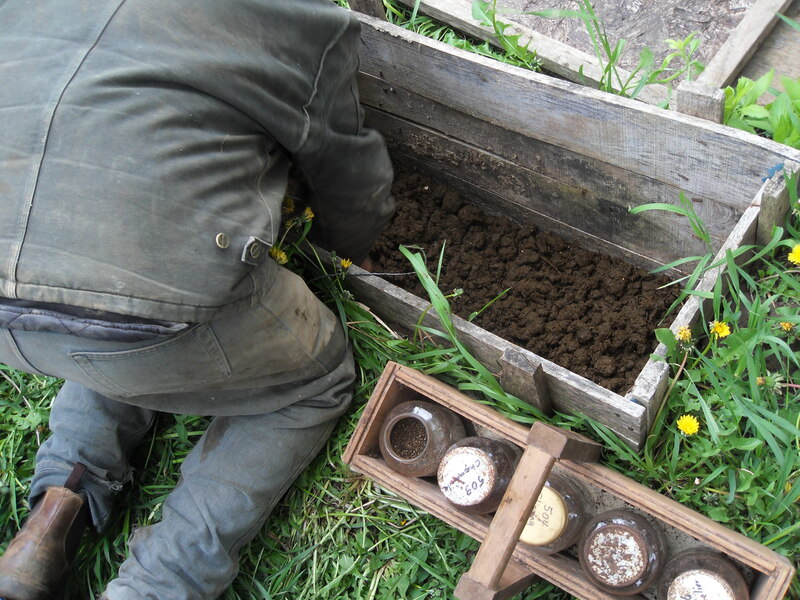 We took 5 pails of 5 gallons (20l) each filled with cow manure, 300g of egg shells and 1kg of basalt (volcanic ash). The eggs have to be raw and then dried up. 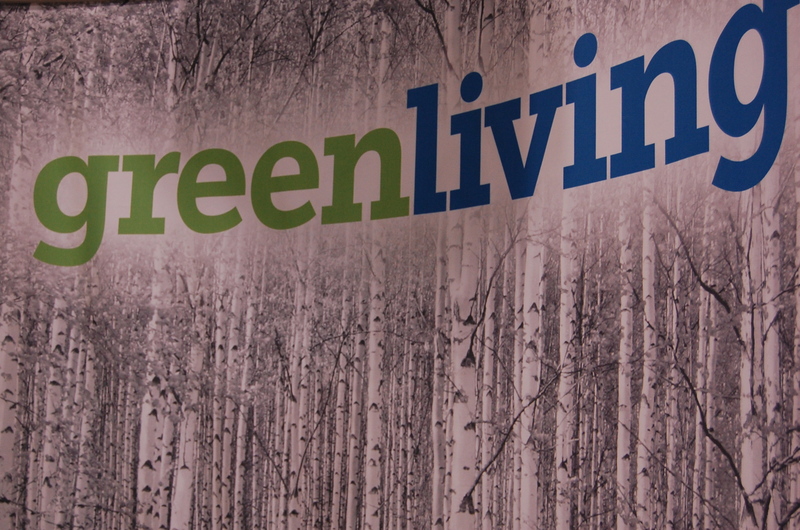 Basalt has clay forming ability, ideal to get a vibrant living soil. 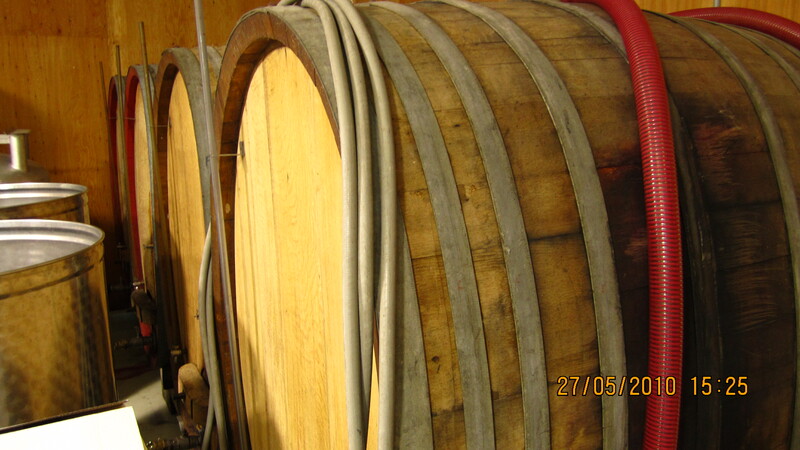 We mix everything up for an hour and we put it in a wooden box half buried (ideally a barrel) into the ground with an open bottom. 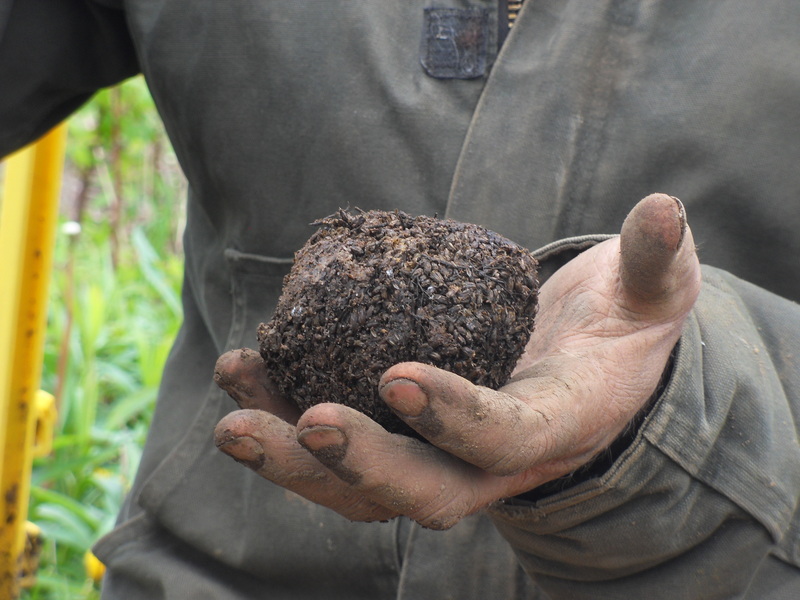 Then Johan put half of the compost into the ground, made 5 holes in a dice shape, added a tea spoon of the 502, 503, 504, 505 and 506 preparations in each holes and sprinkled some dynamised valerian on top of the layer. After that he started an other layer and did the same again. 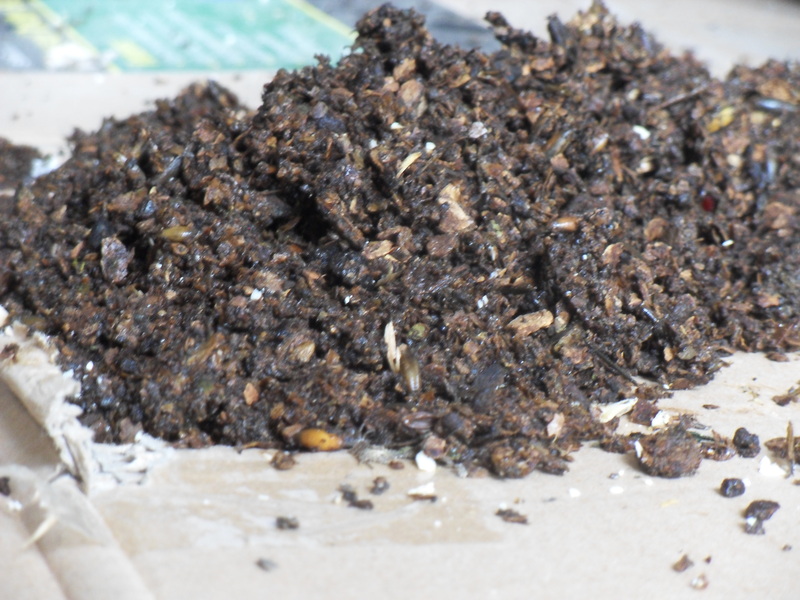 You have to wait for 4 weeks, then you come back, take the compost out, mix it and put again the preparations into the compost. Then after 4 more weeks the barrel compost is ready to use. 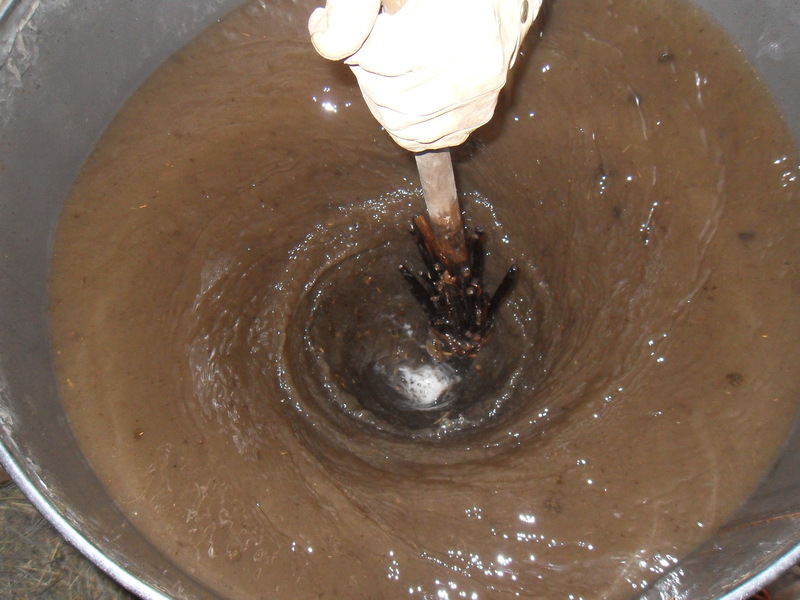 The preparations help the breakdown of nutrients and make them avalaible to the plants. We finished the day by applying the barrel compost preparation onto the market garden. We put a ¼ of a pail (1gallon or 4l) into 35 gallons (140l) of water, we stirred the preparation for 20 minutes in a stainless steel container with a willow tree stick, and thirty people went for a walk into the field to heal the land with their pail full of dynamised preparation in one hand and the whisk in the other. All clear.............. Let's go ! 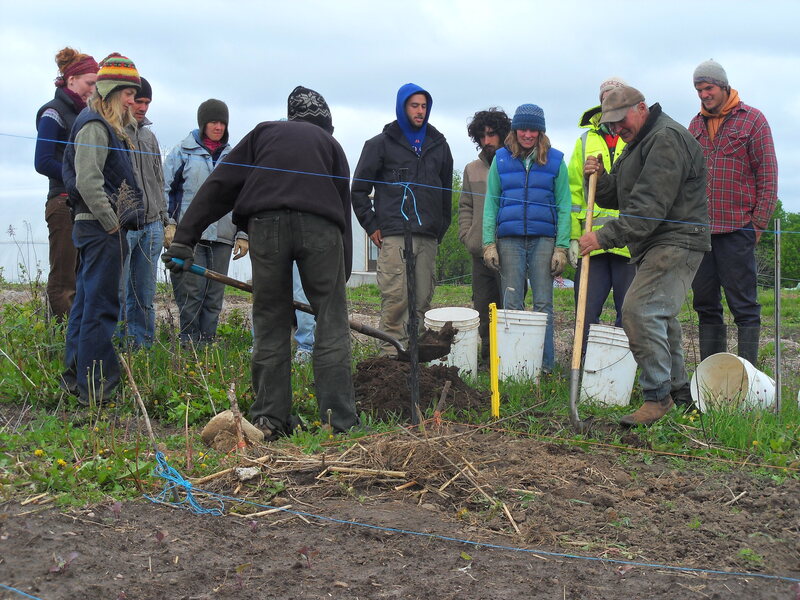 The biodynamic preparation’s day at Whole Circle Farm, a farm which is also a member of the C.R.A.F.T. Ontario program (Collaborative Regional Alliance for Farmer Training in Ontario), was held last Saturday. 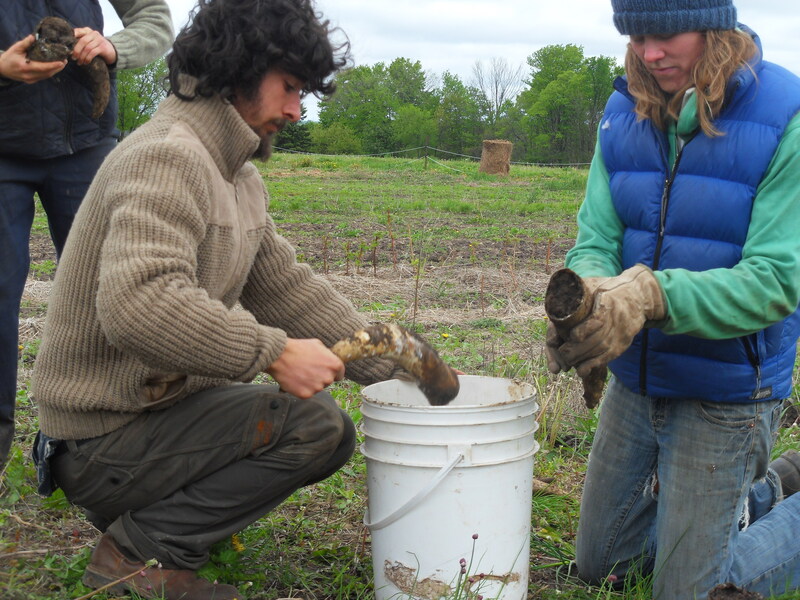 Nearly all the preparations used in biodynamic farming were dug up during that day and it took us an hour and a half to drive down to this farm with Connor, from Saugeen River CSA. When we arrived there, they had already started the day. A gathering of thirty people was listening carefully what Johan, the farm manager, was talking about. It was just the beginning of the introduction of the day. 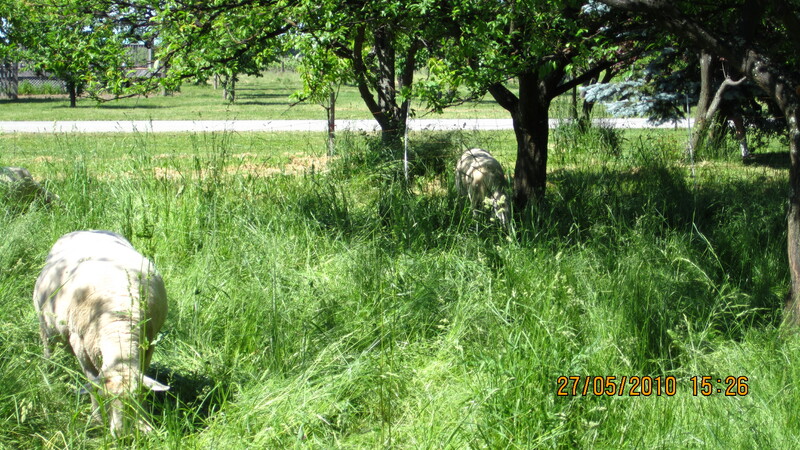 The aim of biodynamics is to make the plants sensitive to their environnements. 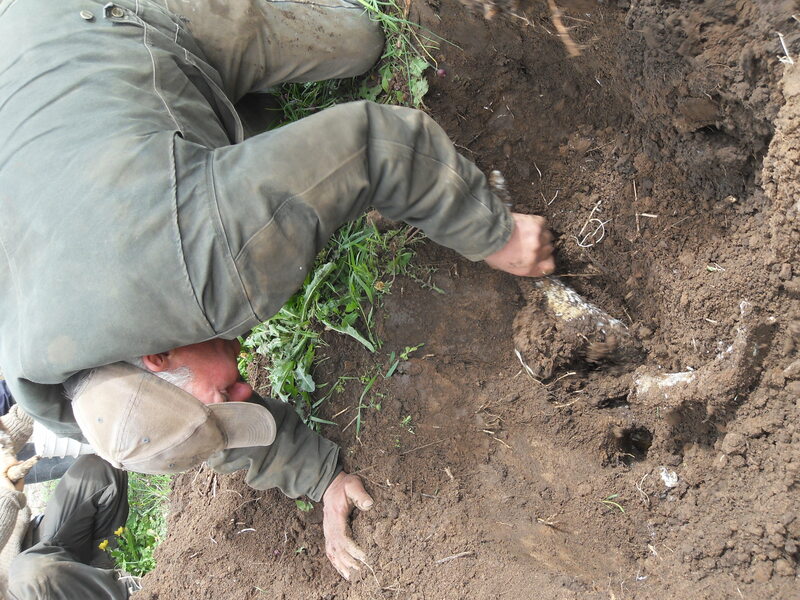 All along the day Johan kept saying that energies and life forces (not substances) are what we are working with when applying biodynamic principles on a farm. anymore if not. To dig a hole 2 feet (60cms)deep can sometimes be a hassle if we miss the right position only from few inches. Johan was commenting the day. Each preparation has a different number (from 500 to 508). They are originated from Rudolf Steiner, an austrian clairvoyant who gave a series of 8 lectures to agriculturists in 1924 in Koberwitz – which is now western Poland. These lectures are gathered in the book Agriculture and give the foundation of biodynamics (from the greek bio – life and dynamics– forces). 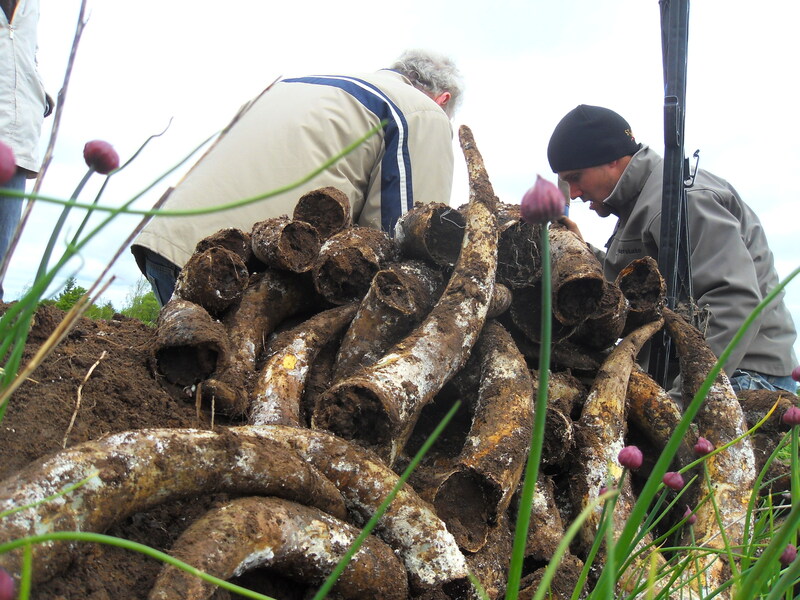 Hundreds of cow horns, originally from Texas, were buried. 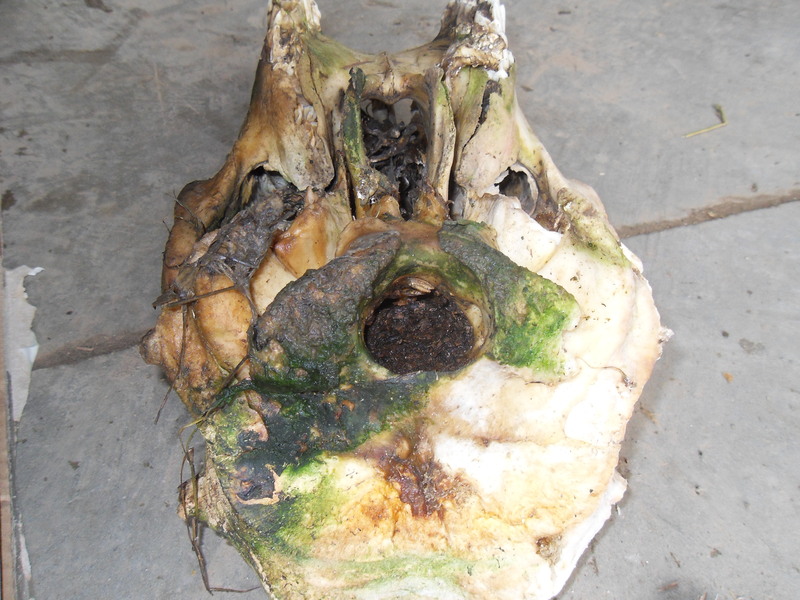 The horns were stuffed with cow manure last fall and buried over the winter. 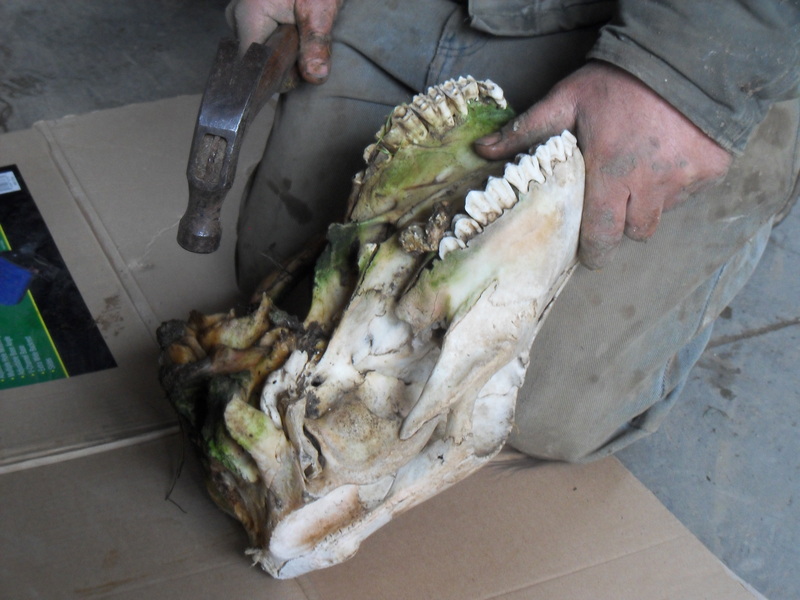 Ideally, horns should be from the farm itself in order to respect as much as possible the close living organism concept that Steiner talks about in his lectures. The notion of farm individuality is something they are still working towards here at the farm. If you want to respect all what Steiner said, you’ll never get started said Johan. Horns can be used three to five times one year after an other, depending of their state. You have to take horns from cows which have been fed with hay or grass, no grains, silage or corns, because their digestive system (with four stomachs) responds to it better. 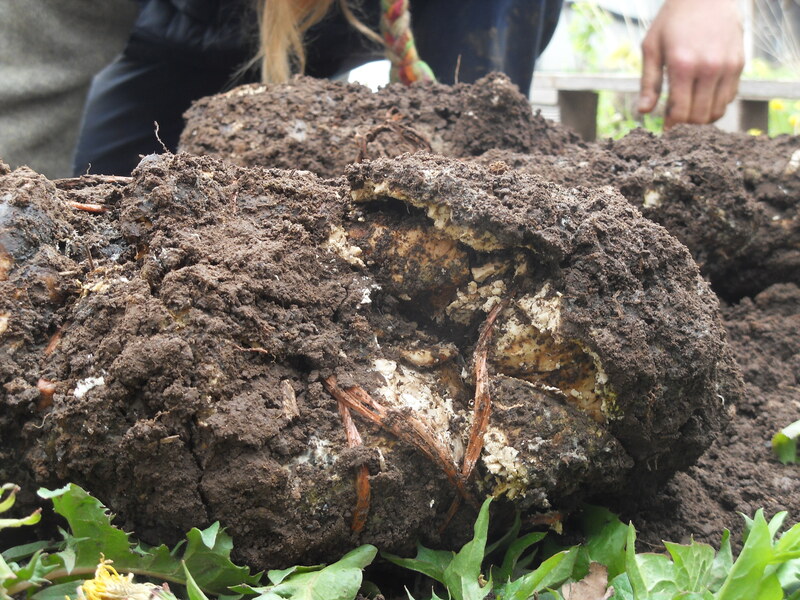 The 500 enlivens the bioactivity into the soil. To apply it, you empty the horn (1oz per acre or 100g per hectare) in a bucket filled with water (3gallons per acre or 30 l per hectare). Then you stir it for one hour. Start on the outside, and as you keep moving, you go towards the middle until you get a nice vortex. Once you have a vortex, you reverse the movement and create a chaos. Then you start in this new direction and you carry on this procedure the whole hour. You can apply the preparation with a brush or a whisk all over the farm. Or if you want to spray them you have to strain it before. Idealy a copper container would be the most appropriate. The 500 is sprayed before we plant anything. It is applied after sunset when the earth is inhaling. We are feeding the soil. When the lunar forces are stronger in wet years or weaker in dry years, the 500 helps restore the balance. It is the silica preparation. 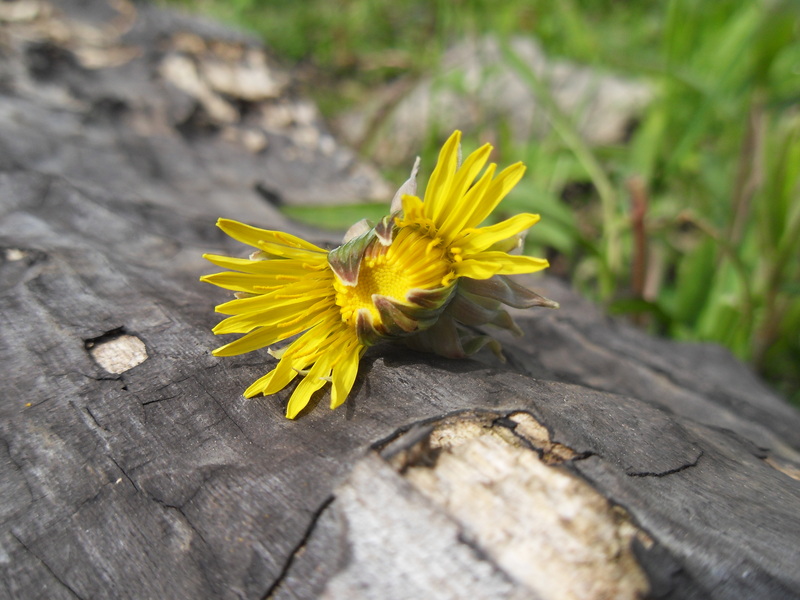 Saturday, we will just talk about it with Johan but normally it is a preparation that you make in spring. You bury it over the summer and dig it up at fall. It is grounded quartz, made into a paste, and stuffed in a cow horn. It helps the plant takes the light and it is used mainly in cloudy and wet areas. It is used homeopathically using only one teaspoon per acre (not even 1g per hectare) put in 3 gallons (10 liters) of water, and stirred also for an hour. The radiation of the silica has been transformed into the water. Regarding the rythm of the earth – inhaling during evenings and exhaling during mornings – it is a preparation which should be made before sunrise. So, ideally, start stirring half an hour before sunrise and apply it half an hour after sunrise over your fields. 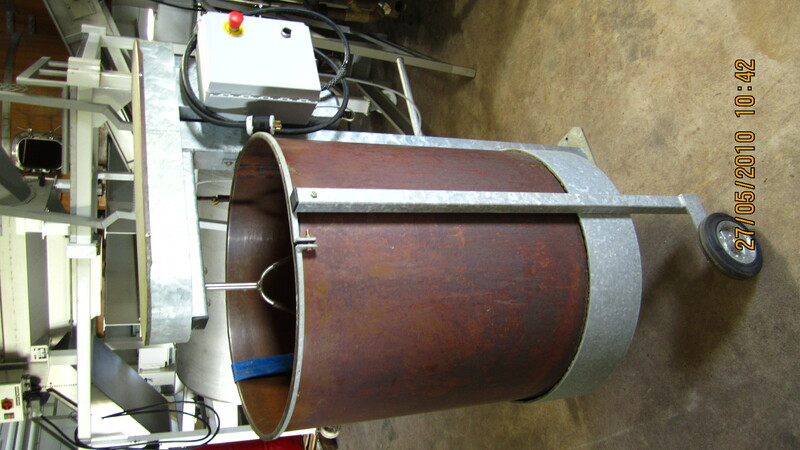 Sometimes the silica can have a burning effect, this is how strong this preparation can be. In any case, don’t apply it after 10.30am. Last Sunday, we were having dinner with Cory’s family, Tania, Georgia, Stefano, Connor and Marike. During the meal we’ve started talking about horses and the possibility for Cory to start working with a draft horses team on his farm in the near future. 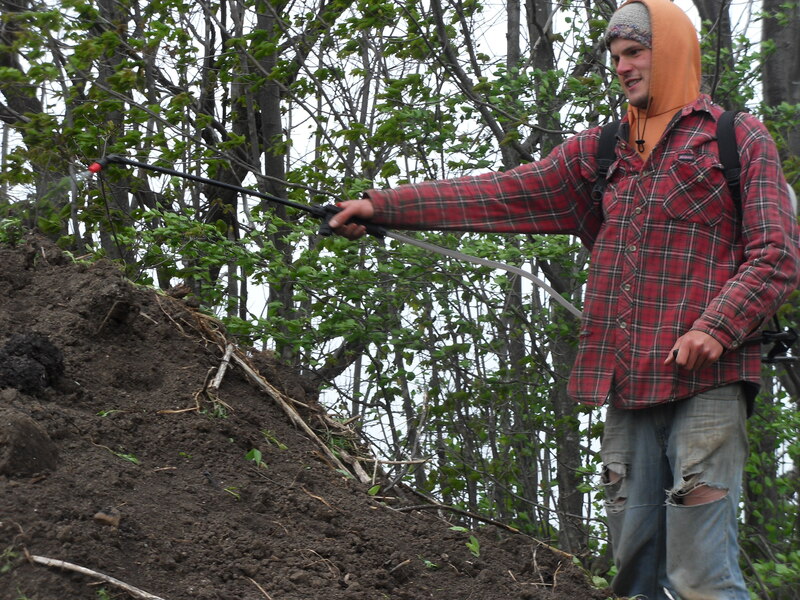 Already when I contacted Cory for the first time last winter, he told me his intention to move shortly towards this other way of working the land with. 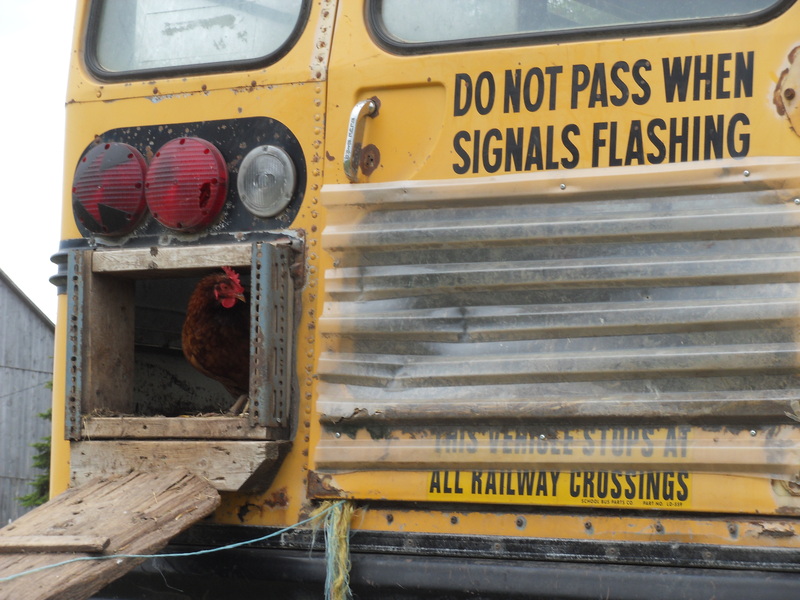 A totally different approach to farming indeed. With a strong interest for horses, I was more curious about the different communities around here who are working with horses since a long time. The most known are probably the Amishs or the Menenites. They are the most knowledgeable people to meet if someone wants to know more about draft horses, that’s for sure. 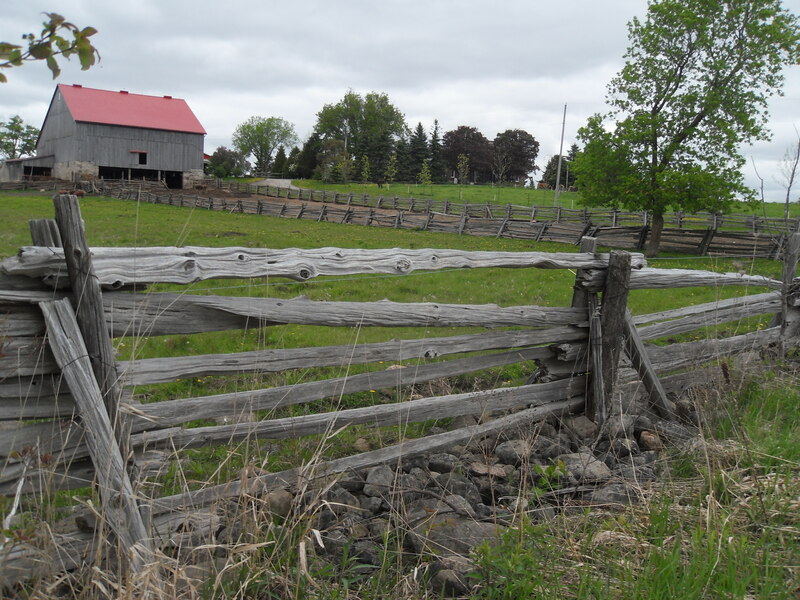 This evening , we went to see Noah’s farm only a few kilometers away from Saugeen river CSA. He is part of an Amish community. As we entered the farm, a little boy of 8 years of age welcomed us with his piercing eyes and bright smile. « Noah is in the house » said he. Arriving in the middle of the farm, we were quickly surrounded by a bunch of kids of different ages wearing blue or green working clothes. The boys had straw hats on their heads. So much life was emanating from them. As soon as the presentation was done, we went into the barn to look at the pair of Belgian horses who was in there. We hitched them behind the trailer, went for a short ride in the field and came back to the farm. 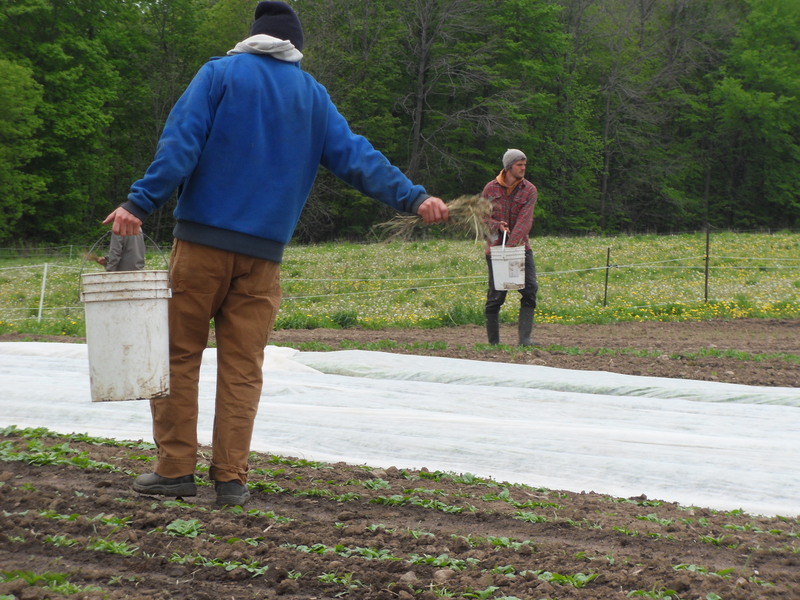 Noah is working on a 200 acres farm, of which only 100 acres are under cultivation. 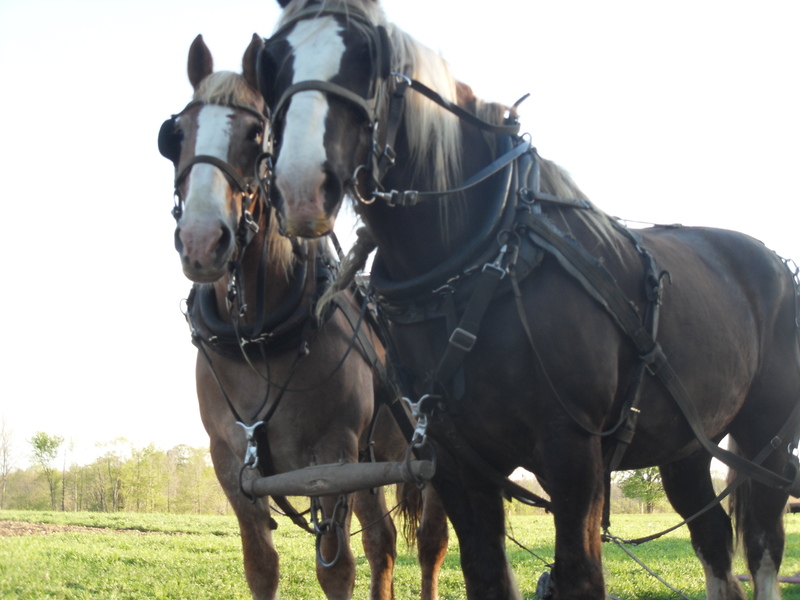 Everything is done with the horses: the ploughing (30 acres every fall) , cutting the hay or carrying wood. No shoes are needed if the horses are not going on asphalt roads. With 5 horses, he is able to work his land entirely. He even uses them all five at the same time to pull a disk, an implement used to loosen the soil after ploughing or a cereal crop. By far, my curiosity towards draft horses has been fulfilled tonight. Though, I already hear people saying that to work with horses is going backwards. Well, according to Rob Hopkins, the founder of the transition town movement which started in Ireland few years ago, the peak oil point being around 2015, an alternative way to use oil would be the horse power. In France, more and more vineyards are moving towards draft horses: less compaction of the soils than a tractor, brings the animal aspect to the field, shallower ploughing, and of course free fresh manure. World reknown domains such as La Romanée Conti in Burgundy are working with horses even if they don’t advertise about it. In Bordeaux, Château Pontet-Canet is cultvating its 200 acres of vines only with them also. Instead of going backwards, working with horses might be being 20 years ahead of time. The consumer wanting more and more quality in his food will certainly help the spreading of this movement. 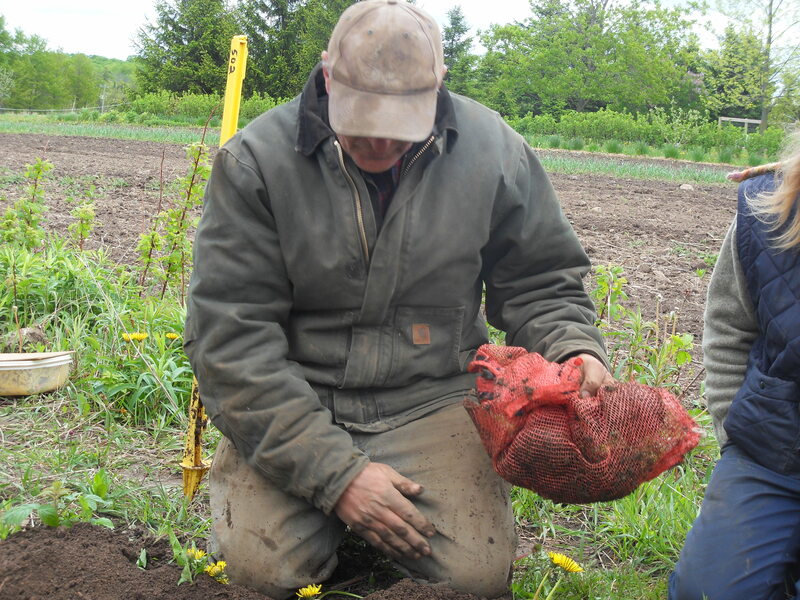 I found a video on You Tube, shot in 2008 about Saugeen River CSA, the farm I’m working on right now. Hey, this is time to start a new blog in english! After all, in Canada where french and english are the two official languages, it is a good place to get the inspiration to do so. You can read the french version of Holy Terroir already for almost 3 weeks now. Just follow the link on the side. After a lot of hours spent in front of the computer trying to figure out how to include both languages on the blog, finally this is the creation of a new blog which seemed to be the most appropriate. I’m just keeping on searching the options available on it. This is really amazing the possibilities we can find on a blog to express ourself…No publisher, no editor, no journalist, so easy to publish on the web. It is never to late to discover new things! In this blog you’ll read posts about wine, travels, farming…and many more subjects. If you don’t read french ( which is absolutly understandable, that’s why this blog is for ! ) 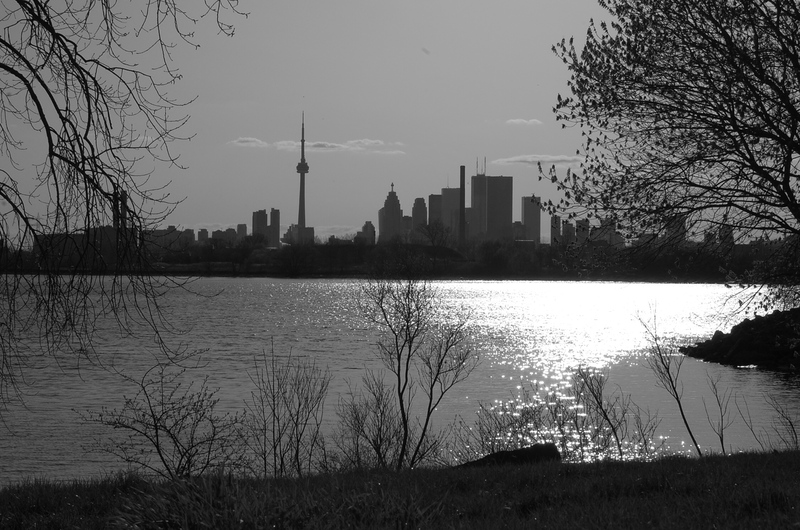 and you haven’t seen the french version of Holy Terroir, I’m now in Toronto starting a 5 months journey accross Canada and USA. The car is already bought thanks to my friend Lena, and the Black beauty (the car’s nick name) is ready to hit the road!